Yea boasts historic buildings and a thriving main street with many pubs, restaurants and cafés. Take a stroll in Melbourne’s closest classified wetlands and learn about the unique flora and fauna. 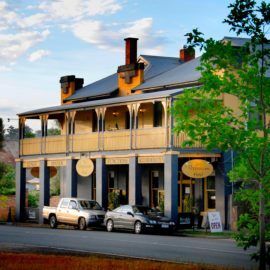 North of the Great Divide, the township of Yea is nestled in a beautiful valley at the meeting of the Yea and Goulburn Rivers, just one and a half hour’s drive from Melbourne. The nearby Cheviot Tunnel, together with the heritage-listed Yea Railway Station, are timely reminders of the important role rail transport played in early settlement. The historic Railway Station built in 1889 is the most intact example of a small group of standard Gothic-styled railway station buildings. In the station precinct you will also find a playground, skate park, toilet facilities, picnic tables and BBQs.